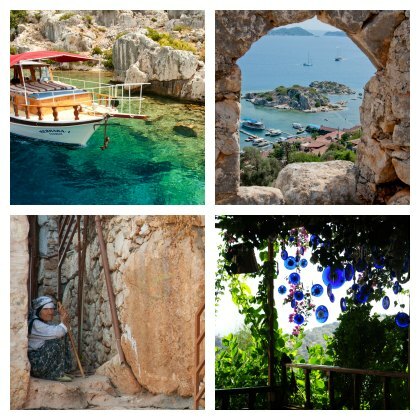 Kaş is a small harbor town in the city of Antalya, located in the Aegean coast of Turkey. 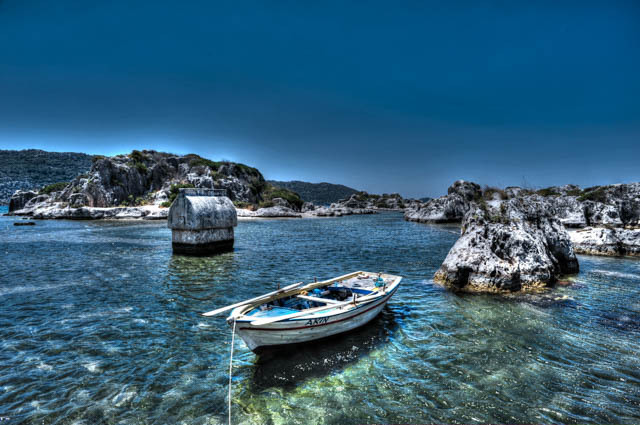 Being famous as a diving site and visited mostly by local tourists and divers, it is an unspoiled place which is far away from the hassle and noise of the famous Turkish Mediterranean coast towns. The coastal area of the town is rocky and there is no direct sand beach next to the town, and the geography around the town does not allow more construction to be done around. Because of that, mass beach tourism did not spoil the place as intensely as the other towns in Antalya (at the time of this writing). The population is around 8000 residents and in summers, especially in the holiday periods, Kaş hosts around 20.000 local and foreign tourists (mostly from UK and Germany). 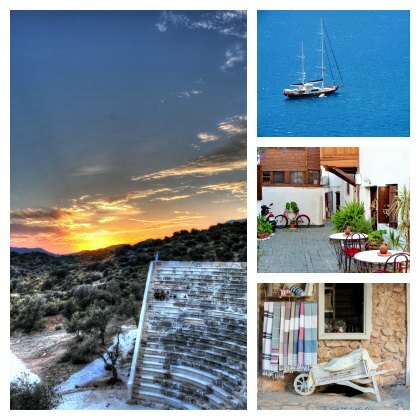 I personally like Kaş a lot and visit it often, one of the places which is impossible to get bored of. This place is mostly suited for people who are seeking an authentic and calm Mediterranean town for their trip, where they can also experience local culture and meet local people. 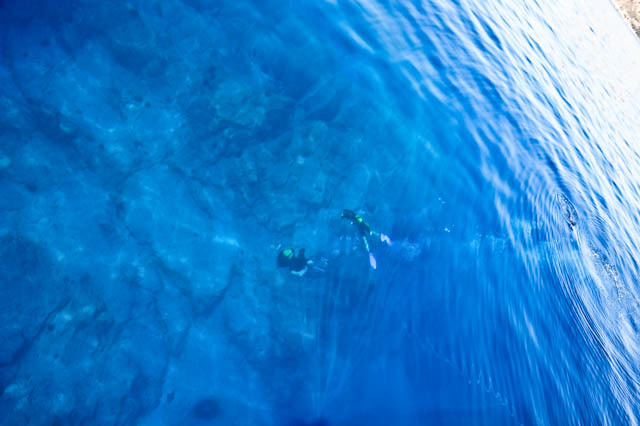 There are many things to see and do in Kaş but diving is the most interesting activity of the town and it has beautiful diving sites in a huge underwater national park. Some of those are the "Kanyon", "Camel Reef" and and the Italian bomber plane wreck. It is possible to see nearly all mediterranean fish species in your dives since complete underwater area of Kaş is a national park, including extincting species of mediterranean grouper. The diving season of the town starts early on March and goes until November. Although winter season is quite rainy (sometimes flooding), it is always possible to make a good dive. For diving schools, please take a recommendation before you go there. There are many diving boats in Kaş and unfortunately some of them are not good, especially if you go for the lowest price. Kaş town center is located next to its harbour but the town is surrounded by hills around, and it gets quite steep as you move away from the center of the town. Therefore I recommend staying somewhere close to center of the town or arrange yourself a vehicle to bring you back and forth if you do not enjoy walking steeply uphill. Of course in such a geography, there is possibility for paragliding and you will also find paragliding centers in Kaş. It is possible to hike all the way to the top of the hill (not an easy path!) and see the stunning view of Kaş and the Island of Meis from above. 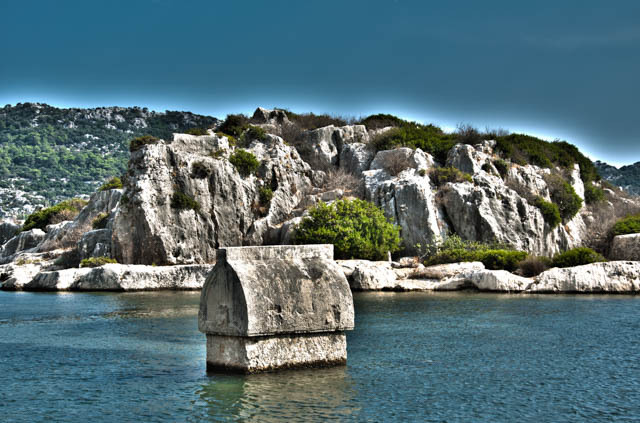 Historically Kaş was founded and inhabited by Lycians and the town has many Lycian King tombs to see, one placed in the main shopping street. 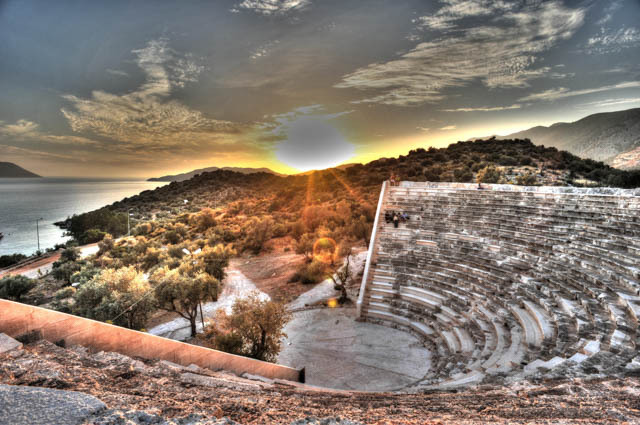 Kaş has an Ancient Greek Theater inside the town, walking distance from the center, where people sit in the evening, drink beers and watch the sunset. 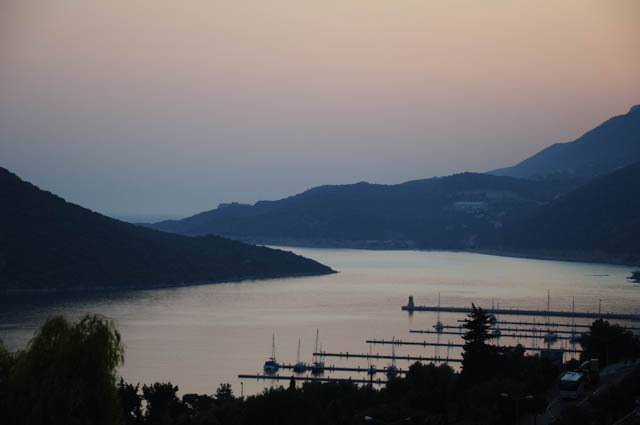 Just next to Kaş, it is possible to see the Greek Island Kastellorizo in distance by naked eye, and it is also possible to go there on daytrips with ferries departing from Kaş. I highly recommend visiting this small beautiful island (needs a visa) and will soon publish another blog about the Island itself. 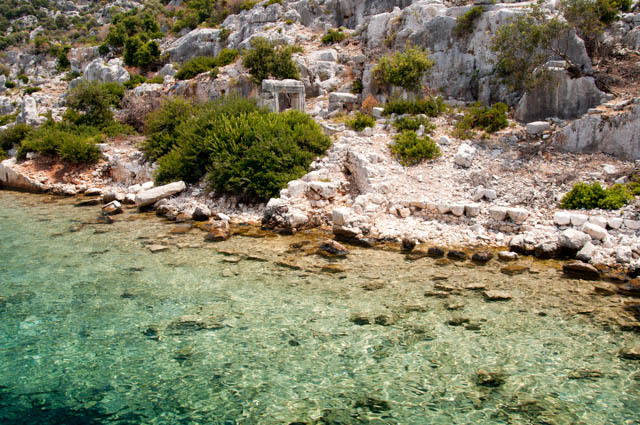 Other historical sites and attractions close by are accessible by daily tours, such as the Castle Island (Kalekoy) and the sunken Lycian city of Kekova. 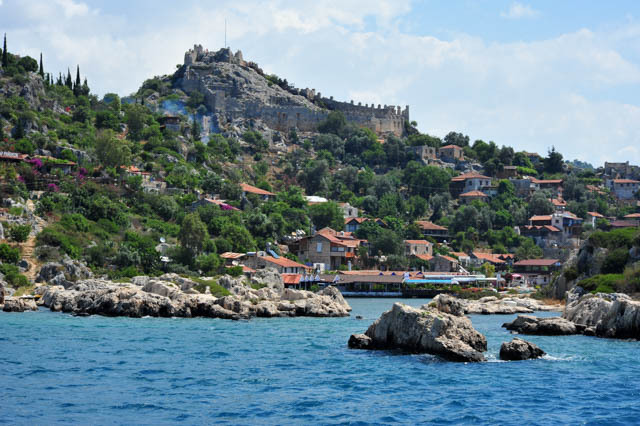 Kaş does not have a sandy beach itself but it has some swimmable beaches built on the rocks in the town center. These are generally free entry beaches with paid drinks, and have a surprise for you with their water temperature if you swim there in warm summer days. Besides those, there are other sand beaches around the town which you can access by boats which depart every 15 mins from the town center. When you travel the town by bus, you will probably see another beach on your way which looks fantastic down from the road. This beach is called Kaputaş Beach and it is the one that is used in Turkish Tourism advertisement posters. Although the beach looks nice, the sea is generally a bit wavy here. 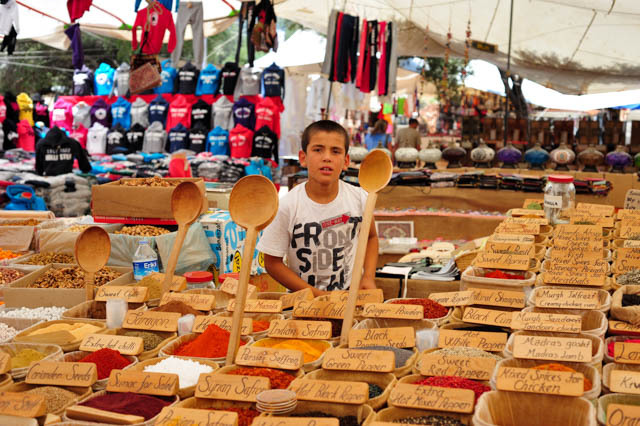 It is nevertheless worth a visit and you may need a vehicle to take you there from the town center. Just ask the place where you stay if they can bring you (and pick you up) from the beach. The beach has a good nature, no facilities (no restaurant and toilets) and in early spring there are many tiger butterflies on the beach to see. Other interesting beaches for swimming are also accessible by daily boat tours. 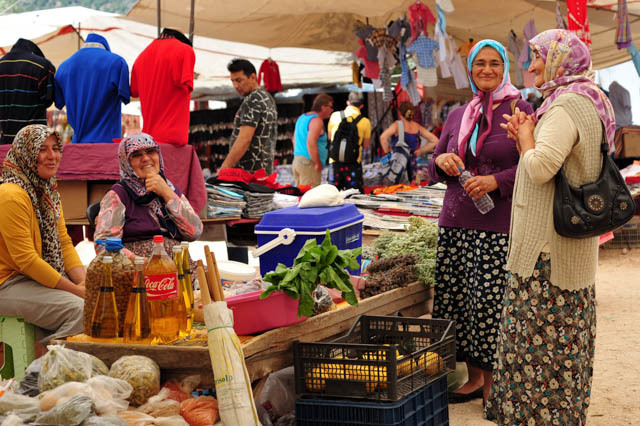 On Friday, Kaş has a quite nice local market to visit, which sells locally harvested vegetables, local products, food cooked by villagers. The olive oil which is sold in plastic pet water bottles are cold pressed by villagers and has a delicious taste. Please try (you can drink a bit by asking) before you buy it and buy the one you find having the least acidity. If you go there around August or September, you can find locally produced pomegrenade sauce, which is great for using as salad dressing and for marinating meat. Kaş a transfer paylaşalım mı? Another possibility is taking a bus from Istanbul to go there, which takes around 13 hours. I recommend going there in late spring, like April or May, or late summer like September. It is a small town with a lot of hotels and during the summer period it generally is very crowded. Visiting in non-crowded season is recommended. 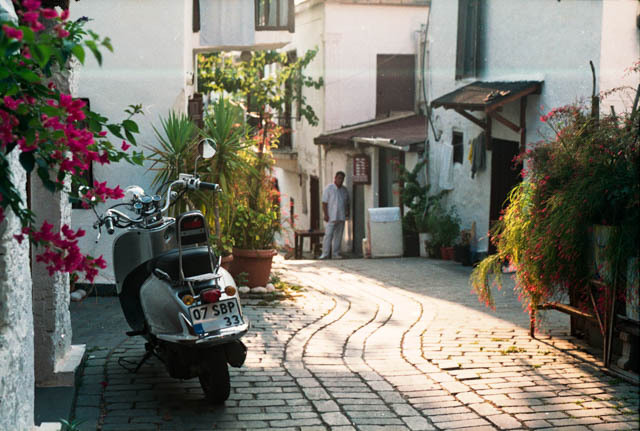 There are many pensions and small hotels inside Kaş, and some big hotels far away from the center of the Kaş. Many of this big hotels are constructed on the peninsula surrounding the Kaş, which supposed to be a nature site, therefore destroying the nature there. 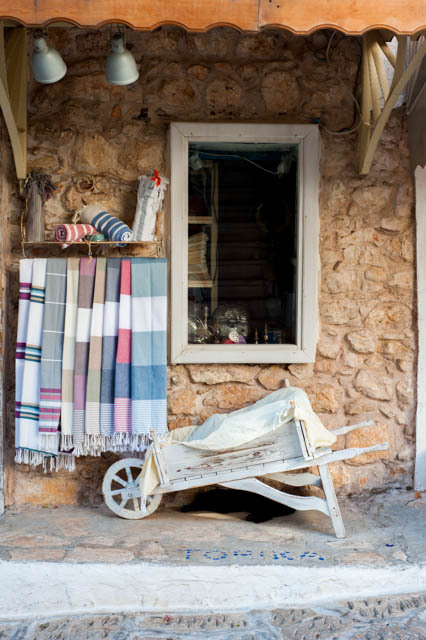 In such an authentic town like Kaş, I recommend staying one of the local pensions and hotel which local people run, or hiring a room in one of the native houses owned by locals. 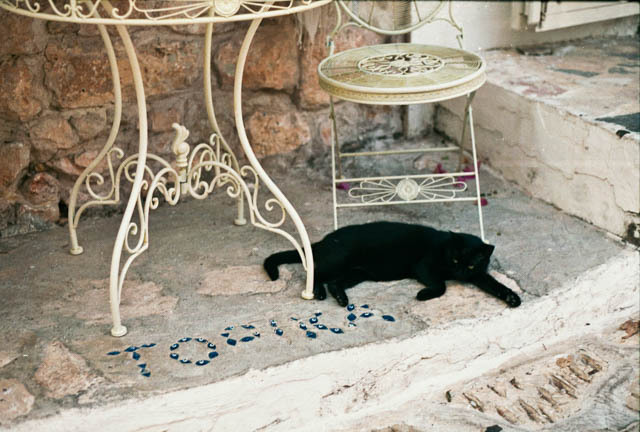 Locals of Kaş are quite nice and friendly, many of them speaking English good because of the tourism. You can find quite good pensions in Kaş town centre by checking the reviews on internet sites like tripadvisor or booking.com and you will not be sorry for it. If the pension you choose is up on the hill but, make sure they have a free vehicle option for bringing you back and forth to the pension, because it will be challenging to walk uphill. But on the other hand, pensions uphill have a beautiful view of Meis Island from their balconies :). Kaş has some nice restaurants to eat, but mixed in a crowd of restaurants with touristic mentality, bad food and lousy service. Please eat in Kaş only upon recommendation or checking, studying the (bad) reviews of the place before you eat there. It is also possible to find a good place to eat by getting recommendations from your stay or other people you meet on your trips. The town has some non-touristic authentic restaurants in the center, which are serving local food and open all year round. Many of those are quite nice. There is a nice kebab restaurant close to the mosque and an a nice old local pizza (pide) oven in the center which has been there for years. Also, many of the pension owners offer weekly barbecue nights which you should never miss. If you like to eat fish on your vacation there, I recommend doing it in Meis Island, which has very good restaurants on sea food, or sticking with farmed dorade fish (named as 'cipura' there) which will be your best bet for fresh fish. 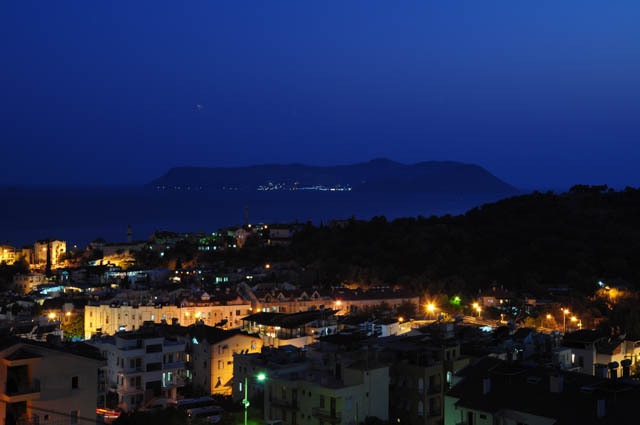 Although it feels like a calm and small town, Kaş has an active night life with many nice bars, tavernas and live music. The local custom is playing 80s and 90s rock and heavy metal music in the bars. 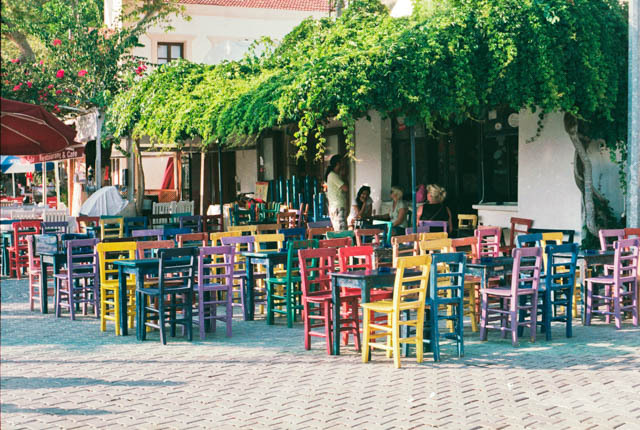 The most famous and authentic one is the bar on the harbour called 'Mavi', which has many colored chairs. 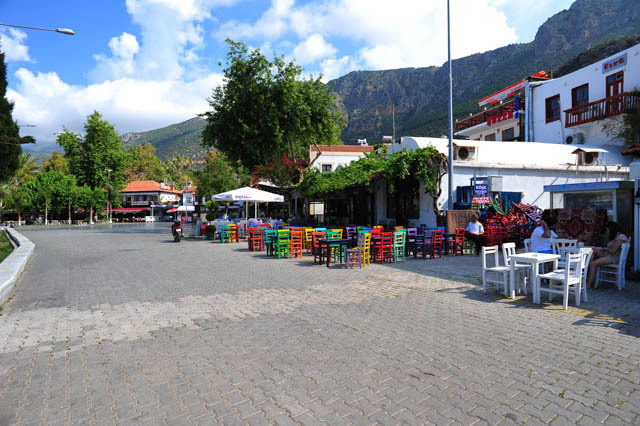 This place is one of the icons of the town and plays nice rock music, while many people are sitting, drinking and chatting with each other on those colored chairs. You will also meet many people sitting on the wall in front of this bar socializing and drinking beer bought from a shop (you will see what I mean if you go there :). 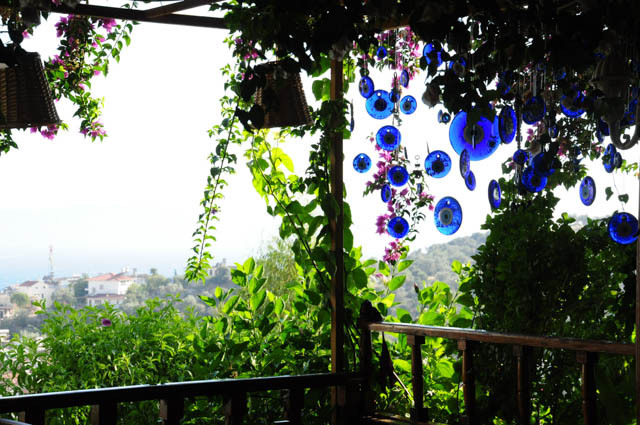 There is also a very good bar called Deja-Vu, when you walk the uphill road next to the Lycian tomb. This bar has a nice sunset view if you go there on time and plays very nice music if you like rock music. There are many other places to hang out at night besides those I mention here so you will definitely not get bored. As locals proud of, the crime rate in the town is non-existing, and I have never heard of anything myself either. You can leave your bags on the beach like everyone does. I have never been there in crowded season so do not know the situation then, but do not think it makes any difference. Local people are nice and reliable. They are also modern and open minded: you can get help from locals on many things you want to do. For the restaurants and diving boats, you should get recommendations first. For the rest I hardly find anything to be careful of... Perhaps if you want to climb to the top of the hill, don't do it with sandals :). Kaş is an unspoiled and beautiful Mediterranean town which offers you a lot to experience if you are interested in the local culture, and planning yourself a trip to see a calm and authentic town on the Turkish Mediterranean coast. Besides spending your vacation in a calm and easy-going Mediterranean atmosphere here, you can enjoy many different activities like diving, paragliding and visiting the beautiful spots in the area by daily tours. 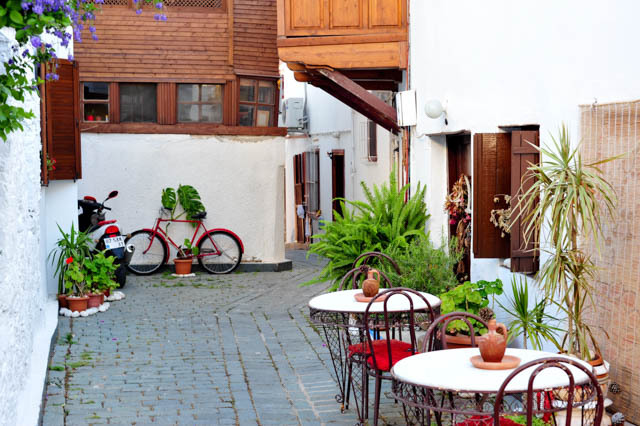 This town is a hidden paradise on Turkish Aegean Coast, which preserved its beauty and is not destroyed by massive tourism. I hope it will always stay like that and will not get spoiled like many other beach towns along the Turkish Coastline.